If curious about what goes into a settlement fee, Potomac, MD residents can count on Eastern Title and Settlement for honest answers. Settlement fees, also called closing costs, are necessary parts of all real estate transactions. They are the expenses relating to purchasing a home or commercial property. Come to Eastern Title and Settlement for convenient settlements at competitive rates. We’ll come to your home, office, or elsewhere to complete a property settlement agreement. Our team is dedicated to offering trustworthy, comprehensive sales, closing, and other real estate transaction services. See all our services for more information. 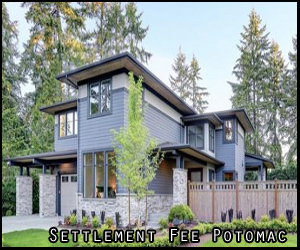 What Goes Into a Settlement Fee in Potomac, MD? As you can see, a settlement fee can include dozens of different fees, costs, and expense categories. The exact expenses will depend on your particular property and the professional services you choose to help with the transaction. On average, closing costs usually equal 2-6% of the amount of a home’s mortgage. If your mortgage amount is $280,000, for example, closing costs could range from $5,600 to $16,800. There are steps you can take to potentially minimize the amount of your settlement fee depending on your transaction. Settlement fees in Potomac, MD aren’t set in stone. They can vary according to the inspection and appraisal processes, the integrity of the title, what an attorney charges, your credit score, etc. Although it’s impossible to avoid closing costs completely, you may have a chance to reduce the amount you’ll have to pay as a settlement fee with the right company organizing the real estate transaction. A great title and settlement group may be able to negotiate fees, compare costs, reevaluate loan estimates, save on points, waive appraisals, and more. Another way to lessen the burden of closing costs is to go with a settlement agency that can come to you for maximum convenience. Eastern Title and Settlement has licensed and insured settlement agents who can conduct closings virtually anywhere in the areas we serve – at your home, office, or one of our locations. We’ve performed hundreds of closings for clients in over 20 years of combined experience. We can close on homes in five different languages. Get to know us better. Our title and settlement company has years of practice helping buyers and sellers with their real estate transactions, from title searches to closing processes. We can answer your questions about settlement fees and help you secure the best possible rates. Our staff stays up-to-date with the latest facts and information on the real estate industry and market in Maryland. We have everything you need to feel confident during closing. Settlement fees might be an unavoidable part of closing on your dream property, but that doesn’t mean they have to create a roadblock for your ideal future. Learn everything there is to know about closing costs with help from experienced professionals. The team of agents at Eastern Title and Settlement want to make every process involved in real estate buying easy on you. We can condense the real estate buying processes and save you money. Whether the goal is to get a comprehensive title search at competitive rates or to save on settlement fees, Potomac, MD citizens can call us at (240) 403-1285 for assistance.